The original Banjo Kazooie on the N64 was my favorite game growing up. Actually, I played Banjo Tooie first and borrowed the first one from a friend later. I guess my young mind didn’t realize “tooie” meant two in Rare lingo. The wacky characters and huge open worlds really fueled my childhood imagination. 2018 marked the 20th anniversary of the series, so I thought it fitting to write a review of the latest iteration of the game: Banjo Kazooie Nuts & Bolts. I played the game when it first came out, but only recently completed it with 100%. Overall, it’s certainly a different experience from what’s expected. If you go get it, do what I did. Get it with the Rare Replay. $10-15 pre-owned for 20+ games is a no brainer. Plus, you can play the series from its from start to finish and really appreciate it as a whole. Let me start by stating the obvious: Nuts & Bolts is not the same genre as its N64 predecessors. Switching up the game style is not necessary bad. 343 produced Halo Wars, a real time strategy in the same universe as the main series. That wasn’t terrible, but it lacked some needed depth. Then, some game series have the special trait of transcending their original parameters. Nintendo could produce almost any type of Mario game and get away with it. Some narrative universes, like Star Wars or Middle Earth, are so massive in scale there’s room for anything. However, Banjo Kazooie Nuts & Bolts isn’t like those types of games. It’s a disappointment because the genre switch isn’t justified and lacks any serious thought in relation to the series. In order to understand and really place any value in Nuts & Bolts, we need to review some history of the series. Everything has a context. So… who is Banjo and Kazooie? What exactly is a Jiggy? What toothpaste does Gruntilda use on her rotten teeth? Let’s overview the essentials! Banjo Kazooie is generally considered one the greatest platformer games of all time. Metacritic ranks the game 92/100 and numerous other publications have awarded it accolades for the art, music, and gameplay. Platformers are games where your character jumps on platforms (go figure) to explore the world and achieve objectives. They could be 2D or 3D. Think of most any Mario Bros or Rayman game. They usually always involve some elements of puzzle solving, finding collectables, and have high replay value. Banjo Kazooie had the perfect blend in a fun, goofy theme. The bear and bird are timeless icons of gaming. The story begins with the evil witch Gruntilda kidnapping Banjo’s sister, Tooty, in an effort to steal her beauty through some kind suction machine back in her liar (and actually if you get a “game over” you see this play out in a cinematic. The results are… eye catching for an 8 year old boy as I was then). Banjo and his trusty bird sidekick, Kazooie, team up to rescue the girl by venturing into the liar and exploring the complex worlds within! Along the way they must collect notes to unlock new floors to the liar, which acts as the hub world, and jiggies to open new worlds. The duo meet memorable characters that aid them in their quest, such as the voodoo doctor Mumbo, the spell book Cheeto, and Grunty’s nice sister Brentilda. Each world in Gruntilda’s Lair has a unique theme with scattered quest that reward jiggies, magical golden puzzle pieces. The original N64 version also had a note challenge where you had to collect all 100 notes in one sitting without dying in a world. I enjoyed the balanced thinking the game took for a child. You could just wander around and collect just enough items to defeat Gruntilda, but that’s lame. It’s a completionist series. Back in 1998, we didn’t have online achievement guides or YouTube “let’s plays”. You had to bring out pen and paper to record notes, like “left cliff = 5 notes” and “CHEATADESERTDOOROPENS WIDEANCIENTSECRETSWAITINSIDE”. The meticulous attention to detail the game required was new and exciting for that time. Banjo Tooie expands on the same themes, introduces new characters and worlds, more boss battles, and added a multiplayer mode. This time Grunty is brought back to life by her sisters Mingella and Blobbelda Winkybunion. In similar fashion, Banjo and Kazooie set out to stop the witches from using a laser to turn everyone into zombies. Fast forward 8 years to Banjo Kazooie: Nuts & Bolts…Gruntilda’s head (all that remained after her last defeat) hops back to Spiral Mountain to challenge Banjo yet again. The bear and bird this time are fat and lazy from eating pizza all day. The match up is a pitiful sight that is interrupted by the Lord of Games (LOG) who appears out of thin air. He gives Grunty a robot body and returns Banjo and Kazooie to fighting shape. After a lousy game of collecting items, LOG determines a better contest would be a series of vehicle based challenges in his video game world of Showdown Town. So yeah… Nuts & Bolts isn’t strictly a platforming game. You won’t need to explore much of the worlds to find anything. There are vehicle parts in the hub and jingos in the worlds to collect, but they appear as icons on the mini map, really taking away the challenge and thrill of find them. Notes are now completely optional to collect. You can use them to purchase parts and vehicle blueprints from Wumba, yet you’ll acquire plenty as a reward from the vehicle challenges. So why bother driving over any lying around? Nuts & Bolts is more of an arcade racing game. Rare switched the genre in their series finale. But enough introduction, let’s dive into a full review of the good and the not so good! Despite the negative shift away from the traditional gameplay, Nuts & Bolts still has plenty of high points worth mentioning. The main point of the game is building a diverse set of vehicles to complete varying challenges on land, sea, and in the air. There’s a lot of room for creativity in designing the perfect race car, super jet, or submarine. Better yet: have one vehicle serve all three purposes! Some of the challenges can be quite frustrating until you start to think out of the box in your designing. For example, there’s one mission on Nutty Acres where you need to defend Bottle’s prized statue from a swarm of Grunty bot planes (“Save Our Statue”). Naturally, you would think you should build your own nimble little plane with some egg shooters and a torpedo or two. Certainly, you could earn a trophy that method, but I’ll let you in on a secret… you can complete the mission perfectly by landing a cage-like vehicle over the statue and literally doing nothing. The bot planes will suicide themselves in an attempt to break through and damage the monument. I think as long as you use heavy blocks, you should be fine. There’s another on The Jiggosseum where you have to drop down a ramp and let the momentum carry you a set distance (“Unhappy Landings”). Mr. Fit recommends a slim and fast vehicle. Instead, you’re better off creating a bouncy ball by adding bumpers on all six sides and slanted corner blocks on the edges. Most of the challenges are similar to that kind of thinking. You don’t need to play fair or very logical to win. Some of the missions require you to use “LOG’s Choice”, forcing you to only operate a default vehicle. However, you can still rearrange and remove parts after you begin the challenge. Take advantage of this when you’re stuck. “Germ Warfare” is a good example. Either rearrange the balloons or jet engine and the challenge is super easy. I don’t need to spoil every solution, but you get the idea. You have lots of opportunity for creativity to win your own way. The wily Kazooie has always been sarcastic and the general environment is wonky, but Nuts & Bolts takes it to a new level of bizarre laughs. Characters often break the 4th wall, mock other Rare games, and give goofy justifications for their challenges. The game really tries to hone in on throwbacks to the previous titles. In fact, one of the worlds of Showdown Town is Banjoland, a museum of Banjo artifacts and little models of locations. And of course, the game ends with a quiz with questions addressing all three games. If you love nostalgia, Nuts & Bolts does a fine job conjuring those fond memories of the previous games. It does however, assume you’ve played them. Otherwise, Banjoland and all the inside jokes won’t mean anything. The original Banjo Kazooie had six literal easter eggs and an ice key that you could only reveal by collecting all 100 jiggies before the end of the game. Mumbo has a cutscene giving the location of three. The other three you had to find randomly or use cheats. It was unknown for a long time what the mysterious eggs did. Fans and hackers tried to theorize possibilities, often coming to silly conclusions. Rare later revealed they planned to tie the eggs into Banjo Tooie. The player would need to “stop ‘n’ swap” game cartridges from the N64. You’d somehow jump between games then (perhaps in a kind of time travel wormhole for story purposes?). The idea was revolutionary and far ahead of its time. The technology of the N64 simply wouldn’t support the concept, and Rare abandoned it. Instead, the Stop ‘n’ Swop items ended up being simply yet another collection task. Fans weren’t too happy with an annoying tease. Wild theories of secrets continued to circulate the early web. Tooie also featured Stop ‘n’ Swop hidden items. They unlocked awesome in-game content but didn’t appear to have any grand connection between the titles. Banjo Kazooie Nuts & Bolts finally gave us the easter egg reward promised through the Xbox Arcade version of the series. Collecting the original Stop ‘n’ Swop items in the first game will unlock exclusive vehicle parts in Nuts & Bolts. It’s not exactly the “game jumping” concept, but it’s a nice conclusion to the mystery that forces you to play through the classic game again. I suppose it also makes sense the Lord of Games, as like a god of gaming, would hide easter eggs for Banjo to find. Unfortunately, the Stop ‘n’ Swop vehicle items in Nuts & Bolts are only cosmetic decorations. Don’t expect an amazing weapon or gadget that enhances the gameplay at all. 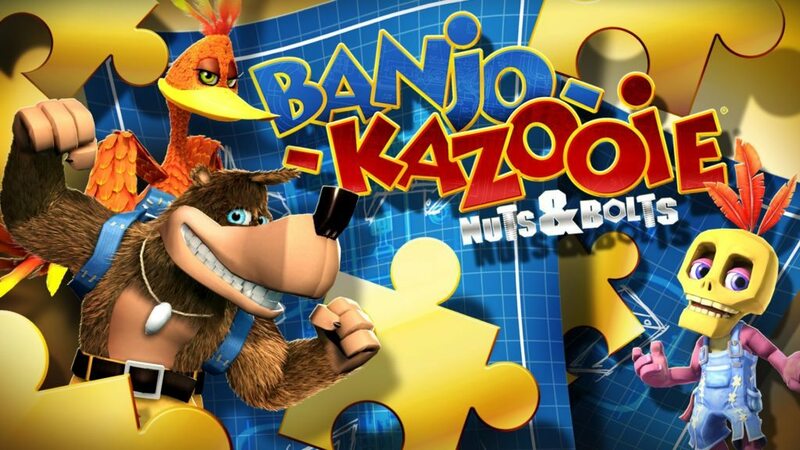 Taken as a whole, Banjo Kazooie Nuts & Bolts hardly seems a fitting conclusion to the trilogy. It’s disconnected from the other games and lacks the intrigue expected. (1) – Who is the Target? The first glaring problem with the game… Who’s the target audience? Traditional fans from the N64 era will be sorely disappointed there’s little need for exploring and no mystery. With all their classic moves stripped away, Banjo and Kazooie aren’t what we remember. Plus, out of 150+ challenges, maybe only five are really difficult enough for an adult to enjoy. If the game is designed for new, younger audiences, then it’s probably a tad too difficult for them. 5-10 year olds will spend more time learning the mechanics of the vehicles than anything. The brief tutorial in the beginning isn’t enough to cover more complex uses of the gadgets. The physics of the game are sometimes unpredictable. Even with high grip wheels, the roads can send you haywire for bumping the slightest obstacle. Weight distribution in the vehicle plays a huge part. Sure a child could figure the challenges out by trial and error in garage, but it’s not really the trend of kids from ‘08. Unfortunately, children these days aren’t very patient. And…. that’s the justification to change in gameplay. It’s almost like LOG is the real antagonist of the game! He wipes away Banjo’s moveset, kidnaps him, and gives Grunty an advantage (she appears to start with a better vehicle). They could have really gone that direction! It would have interesting to have Banjo begrudgingly join forces with Gruntilda against the greater evil. Kinda like Goku and Vegeta banding together out of necessity to defeat Frieza. How cool would it have been to switch off between Banjo and Gruntilda for different missions and see that dynamic in dialogue and action? But nope. That didn’t happen. Really, there’s zero development in the characters together. In Banjo Kazooie and Tooie we learn more about the past and connects of each character, however simplistic it seemed. Nuts & Bolts dumbs down each character. Mumbo… is a mechanic? Bottles has come back to life for no reason at all. The game also offers no explanation as to why all the minor characters would compete in the various challenges. Are they also trapped inside the gaming factory until Banjo completes his trial? In that case, I really feel bad for Bottles. That mole has a family he cannot see because he’s a prisoner of LOG. The fact LOG has to recruit “reject” miner characters to play actors in his universe proves he’s a pretty poor designer. And, they only introduce one new main character: Trophy Thomas. The tiger athlete has no background. Is there a tiger tribe island near Spiral Mountain? Who knows! The game is also full of generic enemies. Each world has some variations of the Grunty bots. These rounded balls of metal try to smash your vehicle if you get too close. Some are annoying suction robots or larger than others. Even if they kill you or you drown in water, you just revive again in the same spot with no consequence. I think robot enemies would only make sense thematically on Logbox 720. Wouldn’t there be aliens enemies on Terrarium of Terror? Maybe macho men in Jiggosseum. Again, bad designing by LOG. Grunty’s role in LOG’s universe is to prevent Banjo from returning home. But then we have to ask… why does she sit around the town center doing nothing? She appears six times as a boss battle across the worlds. Seems odd not every level would be a boss battle. The previous games, you have to go to her because she’s occupied with her own motives (seeking beauty and then turning people into zombies). But it seems odd to walk right past her in Nuts & Bolts and even hilarious to ram her with your trolley car. She’s the endgame boss of the series, and yet she’s just there chilling with the weird cat thing at the start of the game. I guess LOG is the god of video games (even the ones that don’t sell very well), so he’s free to do as he wants. If he wants to make the challenges themselves the main thrill, not any one antagonist, why not… It’s just not what you’d expect going into this from the last games. The story is not meant to be memorable or very connected to the rest of the series. It’s also not meant to be taken seriously. Strangely, the game appears to relish the most in mocking itself. The worlds are certainly huge by proportion to the previous games. They are pretty to look at and all have nice themes… but that’s all. They are simply backdrops for the challenges. There are no unique items to find. Nothing is really hidden. I loved how in Banjo Tooie you could bypass going back to the hub world by jumping directly between worlds through some hidden passages. Then, you could also find and use the train station switches. It was also exciting to hear a glowbo and yet not immediately see it. It’s really disappointing to travel to all the odd spots of the worlds and find nothing exciting. It’s like – why does this space exist for nothing? I was pretty awed at the expansive sky in Nutty Acres. I remember the first time I flew a vehicle all the way to the top of the giant gears and found… a cow? Similarly, there are fake Stop “n” Swop eggs on the top beams of Banjoland. I thought at least Spire Mountain would be worth free roaming, but sadly no… there’s no special collectables at all. You have a few scattered signs that give you some history of the location. That’s all. The waterfall cave is missing, you cannot enter Banjo’s house, and Grunty’s Lair is permanently blocked. You can only choose to wander around for nostalgic purposes. Overall, the game isn’t very fun. The challenges were mostly too easy. You do have countless possibilities to create vehicles, but I found myself using the same 5-6 vehicles for everything and modifying them as I go. Once you get the hang of the mechanics, you’ll breeze through game. The previous games weren’t terribly difficult either, but you felt really rewarded at 100% completion of all the collectables. The challenge in the other games was discovering what to do and where to look. Nuts & Bolts doesn’t feel like a finale. It’s more like a cheap spin-off. Banjo Kazooie Nuts & Bolts has potential. There are enjoyable parts, but it’s not a game really worth powering through to get all the jiggies, unless you really need the Xbox achievement. Again, they could have really had a great twist where you discover a “glitch” collectable in LOG’s games and you slowly program back the memories of Banjo’s old moves with the aid of Gruntilda’s magic. Then you both turn on LOG in the final battle on Spire Mountain. Banjo considers the helpless state of Gruntilda and forces LOG to restore her body as young and beautiful, just like she always wanted. With that act of grace, the witch considers the score settled with the bear and bird. She decides to live peacefully alone in her lair. Finally the curse on Mumbo is lifted and his head returns to normal. Kazooie lays one final egg… she becomes a proud mother of a hatchling. The baby chick squawks an insult at Bottles. Everyone laughs. Gobi the Camel takes the polar bear kids for a ride in the sunset as the credits roll. Well… I am letting my imagination run wild again.